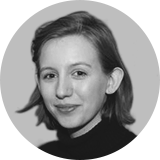 Olivia joined the RCA as a research student in chronographics in October 2015. She joins Florian Kräutli (now completing his studies) and Sam Cottrell (who is half way through his studies in an AHRC Collaborative Doctoral Award with The National Archives). Cultural institutions have become swamped by digital data. Digitising the objects, images and texts in their collections has resulted in millions of electronic records. The question is, how can museums / archives / libraries make sense of it all? Olivia’s research explores how data visualisation may be used to reveal patterns and insights, and to present stories about collection data. A particular emphasis is competing and conflicting narratives. Olivia is currently working with partners at British Library Labs, Science Museum and Wellcome Library. Olivia’s background is multi-disciplinary, bridging science, visual design and the humanities. She holds a BA (1st class) in Natural Sciences and an MSci (1st class) in History and Philosophy of Science, both from the University of Cambridge. Since graduating, she has worked as a designer: leading the graphic design team for a large charitable organisation in London; producing visual and user experience design for a web start-up; and designing anthologies for literary projects. Her current research focuses on programming, data and visualisation. Olivia is funded by AHRC studentship AH/L503782/1 through LDoc, the AHRC London Doctoral Design Centre consortium.